CMT first received the award in 2013, the first year it was presented. In both years, CMT was lauded for its use of minority firms as subconsultants at a level far greater than required by contract stipulations. The 2016 award was also in recognition of the Workforce Diversity initiative that CMT developed for the West Florissant Avenue Great Streets project being led by St. Louis County. This roadway improvement project runs through two cities – Ferguson and Dellwood – with large minority communities. To ensure that the project workforce reflects the demographics of the communities, this initiative provides job opportunities to students in the area so that they can assist in its development. This local involvement will also allow the design team to provide context-sensitive solutions that reflect the needs and the desires of the residents and businesses in the area. An On-the-Job Training initiative was also developed in conjunction with the West Florissant project. CMT formed a partnership with Harris Stowe State University and St. Louis Community College at Florissant Valley, two St Louis area higher education institutions with large minority enrollments. Students with an interest in engineering or other disciplines being practiced on the project have been provided internship opportunities with the consulting firms working on the project. Eight interns are currently engaged, with three working out of CMT’s St. Louis office. These initiatives were inspired in part by the Forward Through Ferguson report, a study to promote improvements and provide opportunities to citizens in Ferguson and the surrounding areas. Among the Calls to Action identified by the commission that produced the report are proposals to enhance access and transportation, promote minority participation in the job market, increase job training, and facilitate employer/educator collaboration. All of these important measures are being advanced through the West Florissant Avenue Great Streets project. CMT is proud to be serving these communities and to be working side-by-side with the talented interns in completing this important project. 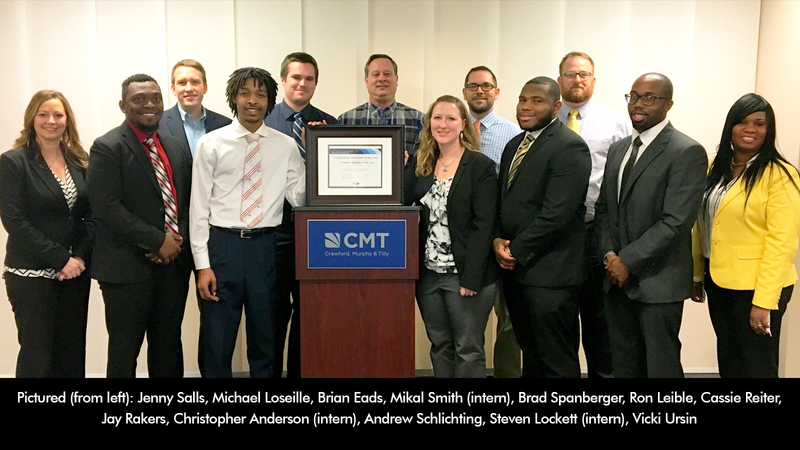 The firm would also like to thank MoDOT’s External Civil Rights Division for honoring CMT with this prestigious award once again. West Florissant Avenue Great Streets project is an enhancement to a 2.6 mile arterial roadway to provide a catalyst for economic revitalization efforts in the communities of Ferguson and Dellwood. In addition to improving economic conditions, the improvements will create an attractive sense of place, while improving safety for motorists, bicyclists, and pedestrians. By making this corridor more attractive to residents, businesses, and visitors, a new narrative can begin to be written.